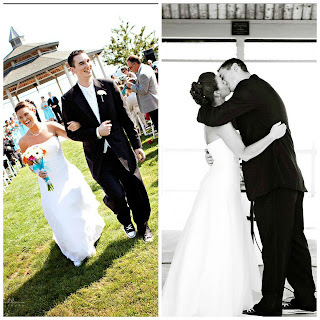 On this day, three years ago, I got to marry my best friend. The love we have for each other has only grown since that day, and even more so since we first met almost 9 years ago. I am a little bit sad on this day, though, since there are people in our life now that I wish had been there on the day we got married. Then I remember, they get to experience the best part with us: the journey. A wedding is a wonderful time, a joyous celebration of two people's love for each other, but it wasn't the BEST day of my life. Every day that I get to spend with Mike is the best day. We have done a lot in the days that we have been married and I can't wait to see what we accomplish together in the future. Happy anniversary, Mike! 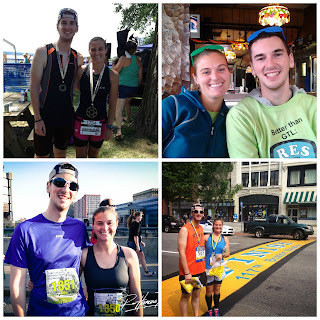 Here's to many more years of swimming, biking and running together and to being training partners in life. I love you! fifteen years down the road from you and it still rocks. I love you both so much I can hardly stand it!!! You are a very special couple. I cannot say enough how we are the lucky ones for getting to call you friends. Have an awesome anniversary because you deserve it. Happy Anniversary! Hope you guys had a great day! Happy Anniversary! Here's to many more!